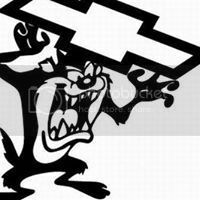 Dallas Area Classic Chevys Message Board Forum Index -> Misc. 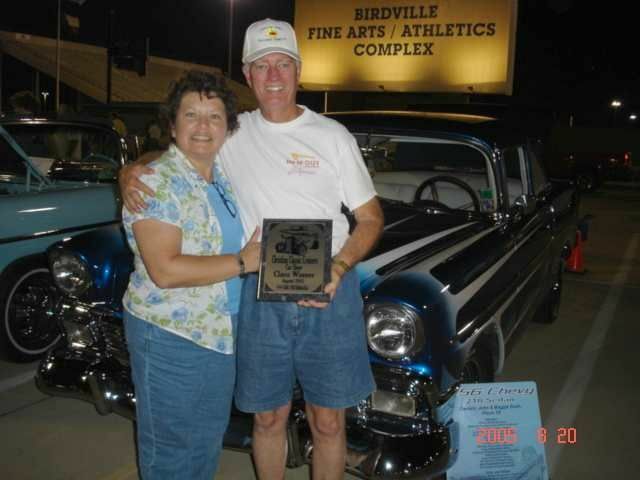 For this week's Throwback Thursday, let's go back exactly one year to the 2015 1st Annual Tri Five Nationals. 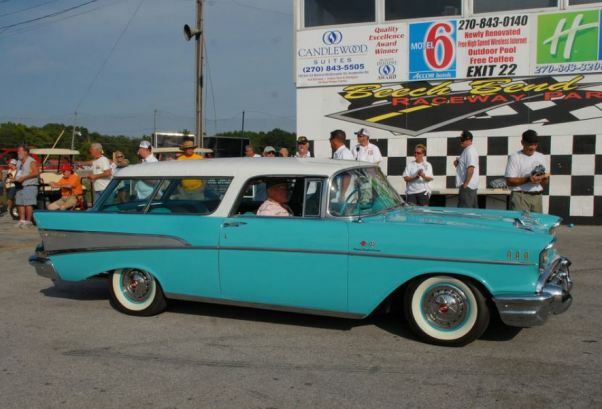 Terry Sealock drove his original Fuel Injected '57 Nomad from Dallas to Bowling Green, KY and was awarded a 'Top 25' of the show out of 1800 in attendance! OUTSTANDING! 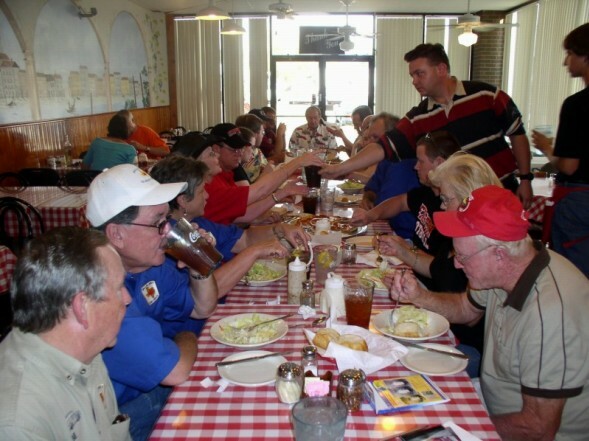 With a rained out 'Hot Texas Nights' show last week that was rescheduled for this week, let's continue the Throwbacks on that event, and here in this photo from 10 years ago in 2006 is the 'Dinner Before The Show' that makes up the first part of this two part event each August for DACC. Needless to say the Dinner is about as popular as the Show! For this week's Throwback Thursday, let's go back to 2005, 11 years ago! It's the DACC heading towards Granbury and the Brazos Drive In for the annual Drive In Movie night! This year's drive in movie event is just around the corner on October 8th and again we will be pointed towards Granbury! Dash plaques have been a traditional token at many car shows and events for years, and DACC's big events have had those in the past and they have been pictured in previous Throwback Thursdays, but this week for Throwback we have pictured the clip on button that was also given out to participants at the 1985 Classic Chevy Club Convention hosted by DACC. It's Thursday so it's Throwback time .. with the Drive In Movie Night on the agenda this Saturday, we venture back 10 years to 2006 and catch part of the Tri Five Chevys heading to the Drive In for this annual adventure for DACC! 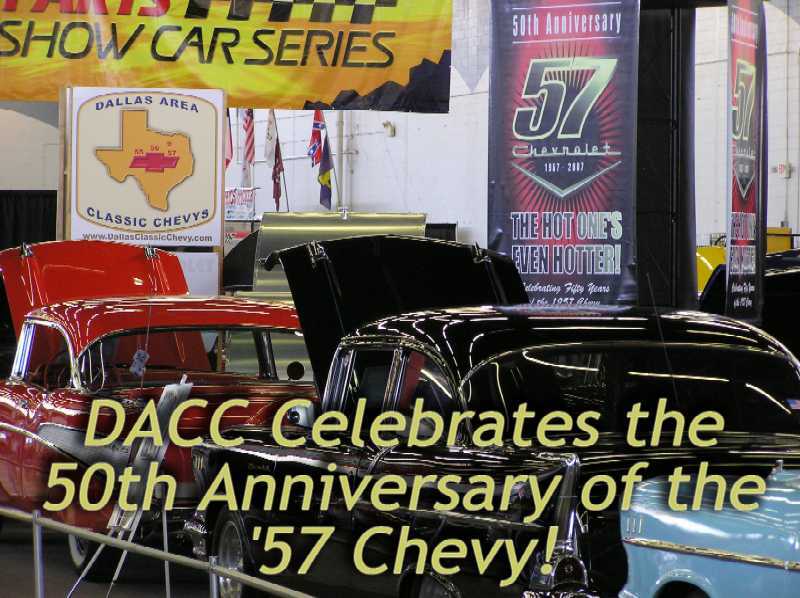 Back in November of 2009, the DACC received national attention in the monthly SEMA mailer. 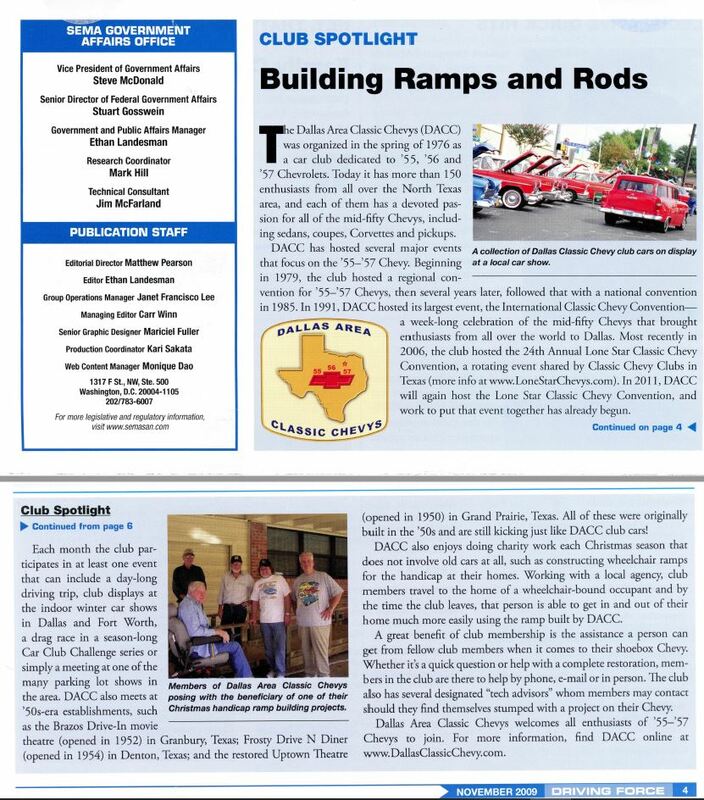 The club feature highlighted the activities of the club and put a special spotlight on our annual Handicap Wheelchair Ramp build that we do each December. 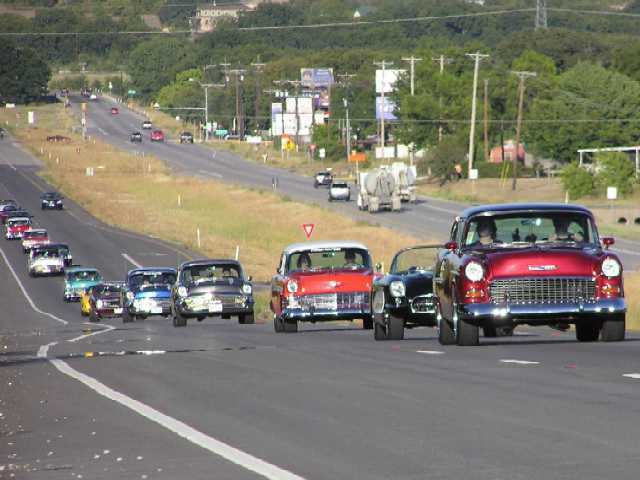 Throwback Thursday takes us back to 2005 to a cruise event the club took up to Lake Texoma. 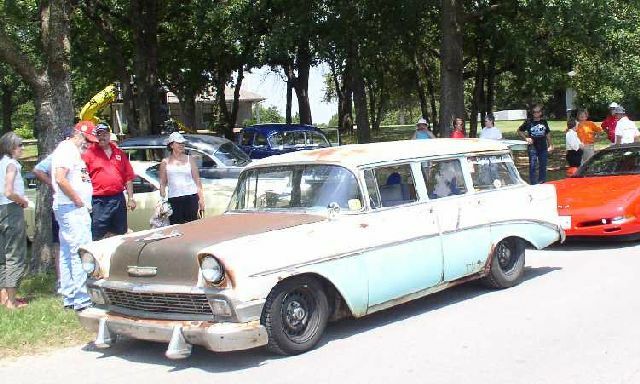 Club member Chad Reynolds brought this rather unique '56 210 4 door wagon on the cruise. Unique in that it was a rusted out '56 and he took that body and after measuring and cutting here and there, welded the '56 body to a 1991 Caprice police car chassis! This car became known as 'Trusty Rusty' and got a lot of attention as it went on the 2005 Hot Rod Power Tour. Chad has gone on to running the 'Bang Shift' website that has quite a following among gearheads. That was a great day! I missed Dennis G.'s garage on that tour. I would like to get to see it some day. Chad has gone on to running the 'Bang Shift' website that has quite a following among gearheads. I have been to bangshift many times. It is a great place, although some how I didn't connect that Chad was the same guy with Trustyrusty and bankshift. Chad is a great guy! No wonder Bangshift is such a great sight. He gave me inspiration to start my own blog, although at a more amatuer level than his site. I wish there was a like button for this post, I would like to hit it twice. And, you can see my yellow Corvair, behind the folks admiring Trustyrusty. 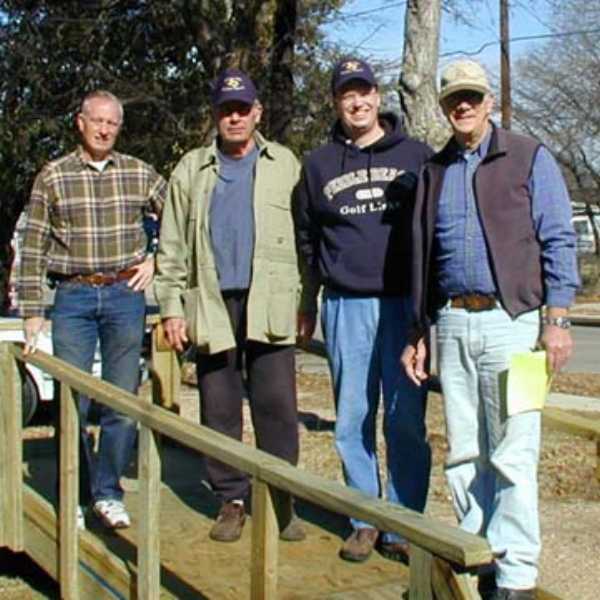 Throwback Thursday today finds us in December, and one of the DACC's mainstay activities each December for the past 10+ years has been the Handicap Wheelchair Ramp building we do in conjunction with TexasRamps.org thanks to Larry Rollow. Here is a team in 2006 standing on their just completed ramp, L to R John Rush, Bob Vaughan, Kevin Brown and Larry Rollow. These ramps give those in wheelchairs the freedom to navigate in and out of their homes and DACC has been a big supporter of this effort! For Throwback Thursday we reflect on 9 years ago when the DACC first went to Mr. Frosty in Denton, and that now has become a annual January tradition for the club. 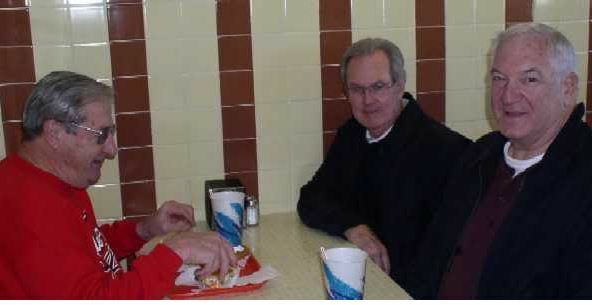 Even with questionable weather this event attracts a great crowd of Tri Fives each year and at that first get together in 2008 you see Don Andre enjoying that fantastic burger that Frosty's is known for while Carl Mitcham and Joe Sanders look on and lick their chops! 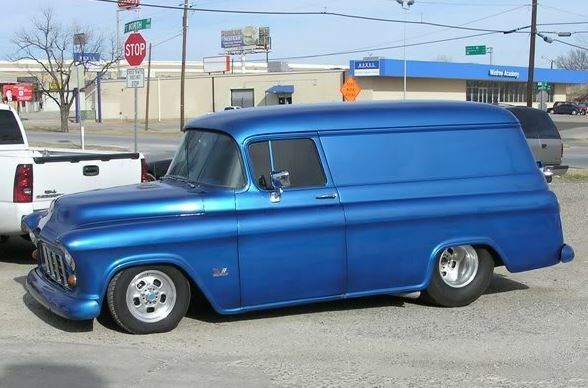 Throwback Thursday this week again is at Mr. Frosty's for a January DACC event, and in 2009 Charles Roppolo showed up in Denton with his very cool '56 Panel truck! With the 60th Anniversary of the '57 Chevy on tap this year, and the Autorama on tap this weekend, let's Throwback to 10 years ago when the club had a ALL '57 CHEVY DISPLAY at the Autorama! Those showing their '57 Chevys at the show included members Ralph Ellis, Bob Senn, Dean Schmidt, BJ Bucher, Charles Rader, Larry Rollow, James Carter, Debbie Guido, George Caruth, Bob Vaughan, Ben Weehunt and Joe Ortego. 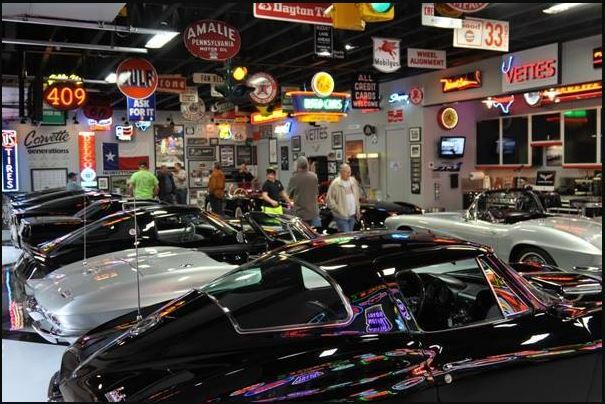 The annual DACC Garage Crawl is coming up soon so for Throwback Thursday this week we go back to 2015 and the first Garage Crawl where one of the stops was Michael Brown's garage that was more of a museum full of Chevys and neon! !